Happy Sunday! How has your weekend been? Mine has been so relaxing and lovely. Kyla (and her sweet Scottie, Franklin) came over on Friday night and we drank crisp, cold white wine while making a splendid dinner of bruschetta and spinach salad. We took our pups for a walk, had long talks, and reveled in one another’s company. There’s nothing sweeter than a night in with a best friend, is there? The rest of this weekend was spent savoring relaxation, free time, and air conditioning – the summer heat has finally descended upon Texas, so it’s been nice to post up indoors and get a few projects done. If you’re in an evening blog-reading mood, enjoy some fun links! 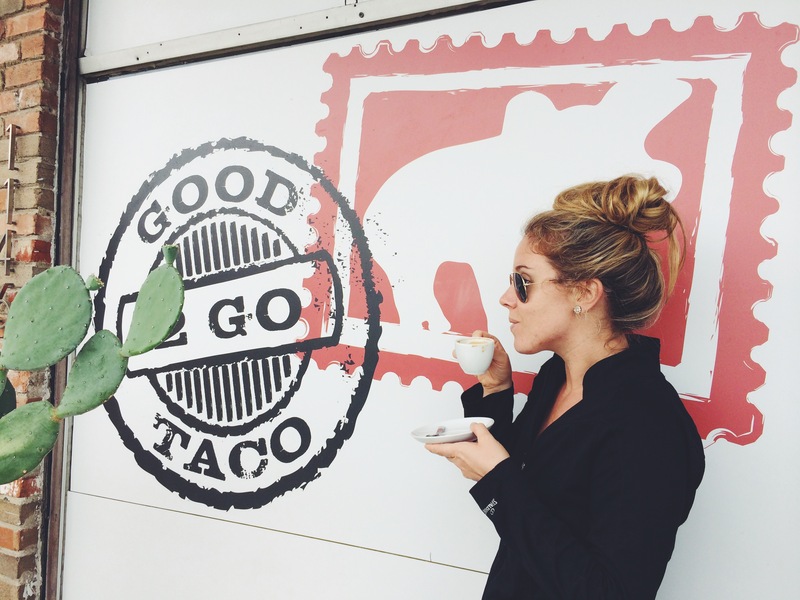 The photo above, documenting my enjoyment of both coffee & tacos at my favorite spot, is a tribute to the blog’s namesake, of course, and an image from Mom & Dad’s visit to Dallas, which I’ll post about soon! While we didn’t eat at Good 2 Go Taco this weekend, James and I did just get back from dinner at Taco Joint, another spot that we love. The restaurant just opened its third location a mere 1.5 miles from our house, which we are very excited about. We love their tacos, queso, and salsas (especially the jalapeño ranch dip). Kyla and I made this blueberry sugar cookie crisp for dessert on Friday evening and it was delicious (James and I are still living off of the leftovers, paired with vanilla ice cream, of course). I’ll post the full recipe on Tuesday! Have you visited Rifle Paper Co.’s website since they launched their new design? It’s so gorgeous that I want to live in it, and it makes me want to buy a bunch of paper products (like the passport pocket notebooks, all of the greeting cards, and the paint strokes weekly desk pad). Allison lent me her copy of The Vacationers and I devoured it this weekend, finishing the entire book in two days. It was so good and so well-written. I highly recommend it!